Back in 1978, Elvis Costello recorded I don’t want to go to Chelsea which might have been a good idea back then but certainly not yesterday as Burnley stunned the champions with a superb 3-2 win to kick off the new Premier League season. 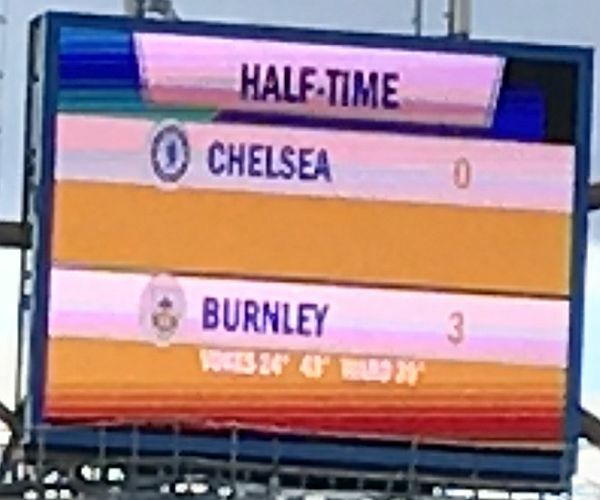 That song was released soon after we’d gone out of the FA Cup at Stamford Bridge, but yesterday’s first half will live long in the memory of those Burnley fans in the Shed End at Stamford Bridge. We couldn’t believe what we were seeing as first Sam Vokes, then Stephen Ward and Vokes again all scored to give us a 3-0 interval lead after former Claret Gary Cahill had received his marching orders. Chelsea, who lost all discipline and ended the game with nine men, did come back in the second half to leave us with a nervous last few minutes but we got through to secure our first league victory there in over 46 years when Steve Kindon scored the only goal in a Monday night game with Burnley already relegated. With the transfer window still open and many clubs still with work to do in that respect, you never quite know what to expect from your team when a season kicks off. As we made our way down, there was some confidence for the season in our car although I’m not so sure there was too much expectation regarding the first game. But, it was a good trip down without any hold ups on the motorways and we were parked up in good time for the final part of the journey via London Underground. It couldn’t be tougher could it, having the champions away on the opening day? They might not be the most stable of clubs with managers coming and going far too regularly but they are a powerful club, one of the super powers according to Sean Dyche, who are not afraid to spend big on new players even more readily than they are to ditch old favourites far too quickly. They were without the injured Eden Hazard and Pedro, who ridiculously has avoided suspension despite his red card last week in the Community Shield. Victor Moses was also ruled out because of his FA Cup diving last season as was Diego Costa who is currently on the long term naughty step and is likely to remain there until he finds another club. As for us, we’ve lost Michael Keane to Everton and Andre Gray to Watford. Both made debuts for their new clubs yesterday while we continue to look for replacements for them. We have made five new signings but when the team was announced yesterday only Jack Cork of those five was in the starting line up with Charlie Taylor and Jon Walters both on the bench. Vokes was the lone striker ahead of a five man midfield which included Cork and the back in favour Steven Defour alongside Jeff Hendrick with Johann Berg Gudmundsson and Robbie Brady in the wider positions. The back four, in front of captain Tom Heaton, was the expected Matt Lowton, James Tarkowski, Ben Mee and Ward. 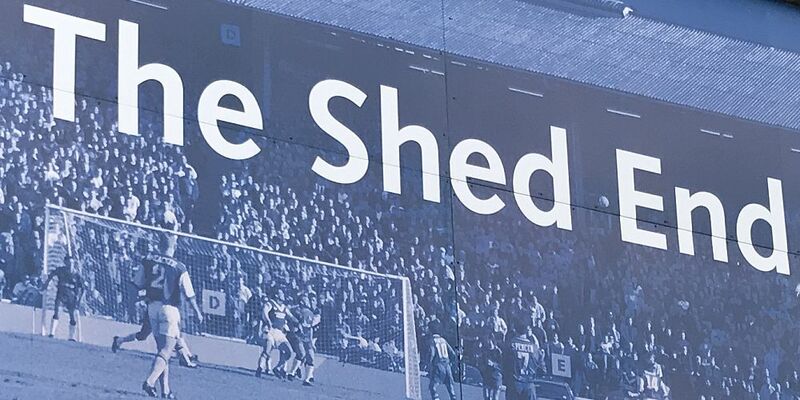 I’ve never thought of Chelsea as a classy club, far from it, they are certainly no Arsenal or Spurs, and the pre-match goings on yesterday were a nonsense. They decided to show off the Premier League trophy (yes we know you won it last season) and introduce the new players one by one. It was all done by some dodgy looking bloke in a suit on the pitch who screamed and shouted down the microphone and virtually succeeded in deafening everyone in the ground. I’m sure there are legal requirements on noise levels and this without doubt exceeded them. You certainly had no chance of speaking to someone next to you, so loud was it. As is often the case, the season started in hot sunny conditions so Chelsea decided to greet the players with fire from a number of boxes in front of the main stand. I was a long way from it but felt the extra heat. It was absolutely ridiculous, then of course came The Liquidator as the teams made their way across the pitch. It was a reasonably quiet opening with Chelsea probably looking the most likely. I remember seeing the clock reach ten minutes and commenting that this was the first time we’d been to Chelsea in the Premier League and not been under the cosh right from the start. I think it is fair to say that the quiet start ended in the 14th minute. They’d already had Marcos Alonso yellow carded for a bad foul but this time former Burnley loan player Gary Cahill fouled Defour. It looked a bad one from my vantage point and referee Craig Pawson had no hesitation from his excellent position. Out came the red card and to be fair there were no histrionics from Cahill. He knew what he’d done and he knew the decision was correct. Playing against ten men is not necessarily going to make things easier as we found out when Ander Herrera, Fernandinho and Granit Xhaka were all sent off against us last season. This time it was different as we took the game by the scruff of the neck and for the next half an hour totally outplayed Chelsea with some wonderful football. Vokes had a goal disallowed but when he got the ball in the net for a second time it counted. There was some excellent football played as we moved the ball across the pitch from left to right and it ended with Vokes turning in Lowton’s cross, the ball going into the bottom left hand corner. That certainly put some smiles on faces in the away end, but those smiles turned to almost disbelief as we ended the half by scoring twice more both initially coming from free kicks. Ward was fouled on the left hand side just over the half way line. He took it short, playing a one-two with Brady and then did likewise with Cork. It left Ward behind the Chelsea defence on the left but there was still much to do. He did it, with a sensational strike from a narrow angle that will surely be recognised as the first goal of the season contender. A free kick on the right a few minutes later saw us move the ball nicely before Defour crossed for Vokes to head home unchallenged and, I can assure you, it was bedlam in the away section of the ground. – and if I didn’t believe it, it said so on the big screen. The half time whistle was welcomed with a massive roar from the Burnley fans. Half time was surreal as we all just looked at each other, hardly able to take in what had happened. Don’t think for one minute this was all about Chelsea being poor or being down to ten men. This was all about how good we were. Sean Dyche said it was up there as one of the best 45 minutes of his time at Burnley and this morning, Oliver Holt from the Daily Mail, described our performance as terrific when speaking on Sunday Supplement. Even Alan Shearer on Match of the Day was wholesome in his praise: “Burnley were superb,” he told viewers. I do recall going to Chelsea once and being 3-0 down at half time. And before my time, in 1958, we were 3-0 up at home in the opening game of the season against Manchester City but lost 4-3. I thought we might face a difficult second half but I was confident that we would be OK and would go on to win the points. Maybe it was tougher than I expected. We almost got through to the last twenty minutes without any concern but then they pulled one back through Alvaro Morata. He’d not been on long as a substitute but he certainly looked good and you wondered why on earth the big summer signing hadn’t started. It got frantic but surely it was ours, I thought, when Cesc Fábregas followed Cahill with an early departure. I think he was fortunate. He’d been yellowed in the first half, rightly so for sarcastically applauding the referee, and should then surely have had a second yellow card long before this incident which he somehow got away with. There was no escape this time as he caught Cork, but again I think he might have been fortunate. It was a second yellow but could so easily have been a straight red. Incredibly, with nine men, they scored again when Morata set up David Luiz, another who could have gone for an incident involving Brady, to score. Now it was time for the nerves to kick in but only inches prevented Brady scoring our fourth. His free kick from right on the edge of the box beat Thibaut Courtois, something he’s done before, bu it hit the foot of the post and came straight out . Then, in stoppage time, we had a couple of nervy situations down at the far end. But when Pawson blew his whistle for the last time we were winners. We were deserving winners without any question of doubt and we were treated to a show of emotion from the manager at the end as he came over with his jubilant players. We’d taunted the home fans with chants of: “We’ve only spent three quid,” during the game but now it was time for the mutual show of support and respect between stand and pitch that we have at our club with the one club mentality. The journey home was as trouble free as it had been going down in the morning and while travelling home I was asked to nominate a man of the match by a national newspaper. There were, to be fair, several candidates and you have to start with Vokes who scored twice. Then there is the other goalscorer Ward; those who travel to football with me know how highly I rate him. But my choice, in the end, was Defour. During that half an hour when we were so much on top, I thought he was terrific. He was involved in everything, was always available, didn’t give the ball away and capped it all with an assist for the third goal. It was a day to remember and we even made the sensible decision to wear claret shorts with the new white away shirt, it looks far better. Elvis Costello – you were wrong. There was nowhere else I’d have rather been yesterday than at Chelsea. Chelsea: Thibaut Courtois, Antonio Rudiger, David Luiz, Gary Cahill, Cesar Azpilicueta, N’Golo Kanté, Cesc Fábregas, Marcos Alonso, Willian, Michy Batshuayi (Alvaro Morata 59), Jérémie Boga (Andreas Christensen 18, Charly Musonda Jr 90+2). Subs not used: Willy Caballero, Fikayo Tomori, Kenedy, Kyle Scott. Yellow Cards: Marcos Alonso, Cesc Fábregas, David Luiz, Antonio Rudiger. Burnley: Tom Heaton, Matt Lowton, James Tarkowski, Ben Mee, Stephen Ward, Johann Berg Gudmundsson (Scott Arfield 75), Steven Defour (Jon Walters 75), Jack Cork, Jeff Hendrick, Robbie Brady, Sam Vokes. Subs not used: Nick Pope, Kevin Long, Charlie Taylor, Ashley Westwood, Ashley Barnes. Yellow Cards: Robbie Brady, Ben Mee, Scott Arfield.